How to add share buttons to the site content? 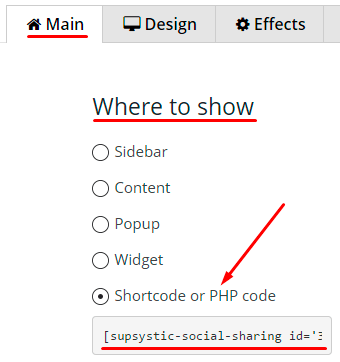 To find shortcode you need to open buttons project settings and select Shortcode or PHP code method in Where to show menu at Main tab. Copy and Paste the shortcode into your post or page and Publish. After that Social Share Buttons plugin will automatically create social buttons on your page using the settings you choose above. You also can change buttons position on page by using parameters Place and Extra. They can be added manually at any social buttons shortcode you need. Both parameters should be used at the same time. Ratio of parameters values are shown in the table below. Any parameter at the same time can receive only one value. Keep in mind that if you choose another method of output buttons in project settings, shortcodes will stop working. 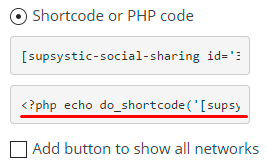 Php code of Social Share Buttons is specified near its shortcode.